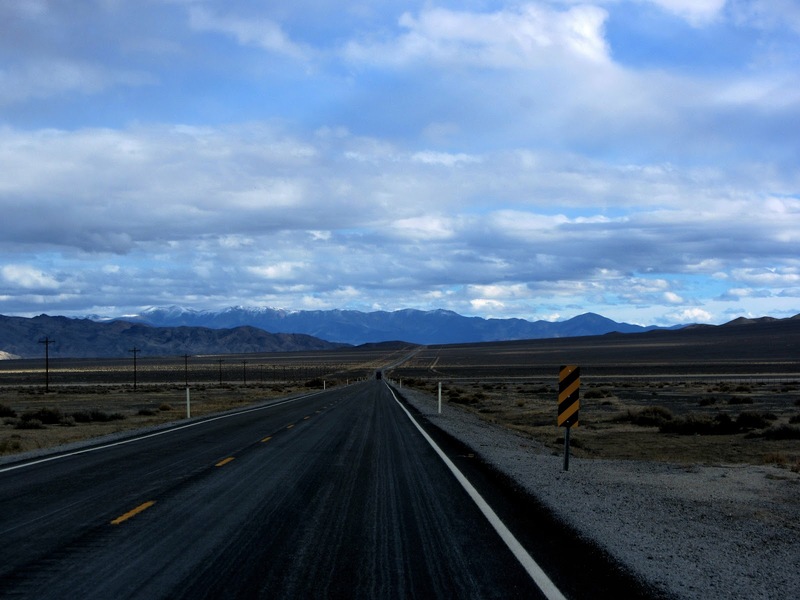 Leaving Reno this morning, we headed east on I-80 to Fernley, where we began our journey on US-50, commonly referred to as 'the lonleliest highway.' 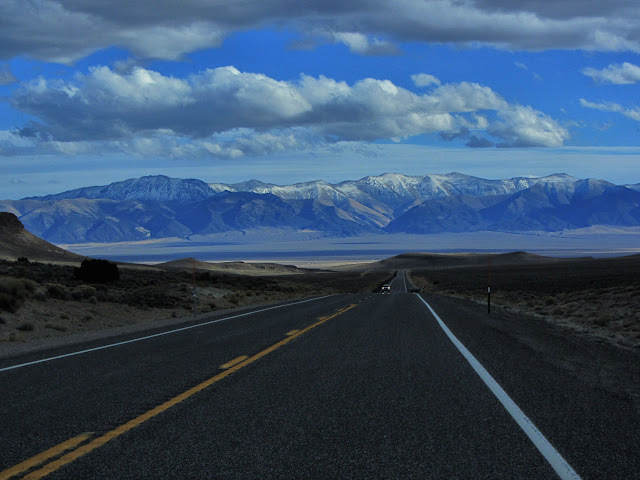 Slicing across central Nevada along the original Pony Express route, the road stretches through extensive barren landscapes of arid deserts and desolate mountains. 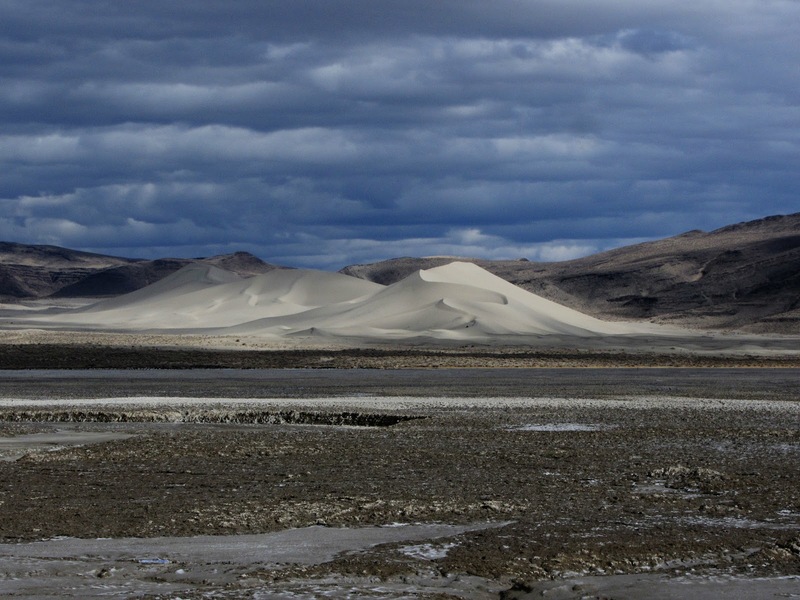 But even in these panoramic vistas of neutral palettes, there is much to see. 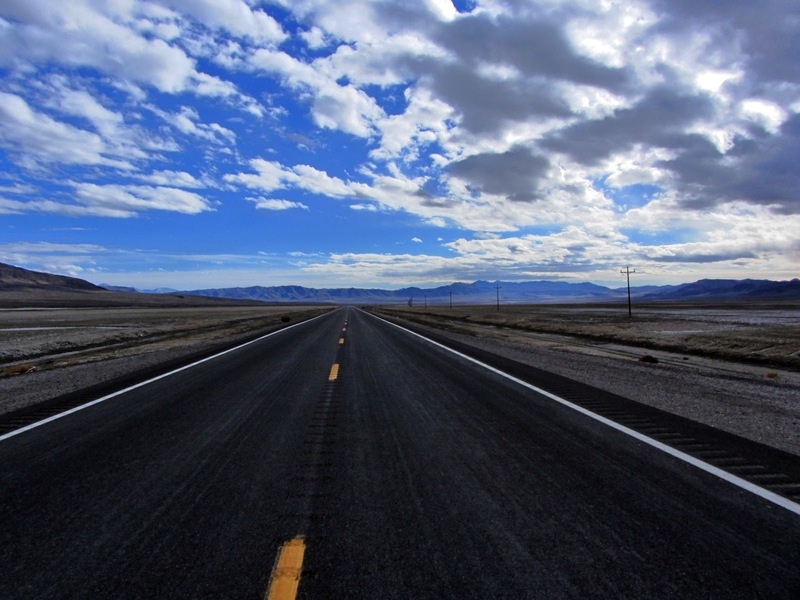 In 1986, a writer for Life magazine christened Highway 50 from Fernley to Ely the "Loneliest Road in America." Legend has it that the writer was venting his frustration resulting from having to wait an extended period in those pre-cellular days for assistance after his car broke down along the highway. 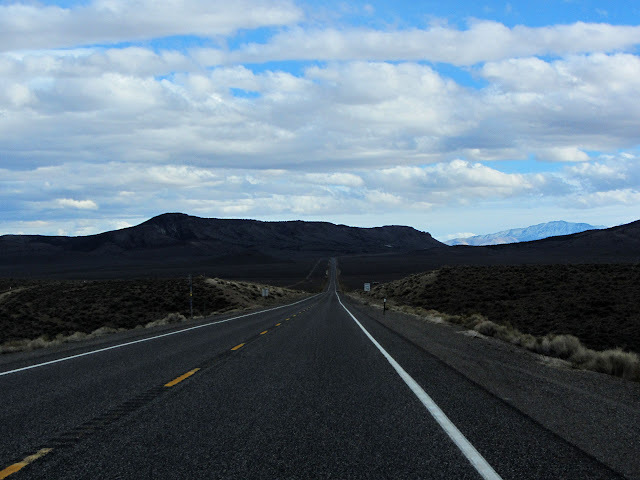 He even extracted a quote from an unnamed AAA agent, who stated about US-50, "It's totally empty. There are no points of interest. We don't recommend it. We warn all motorists not to drive there unless they're confident of their survival skills." Do I hear an Elvis song playing? 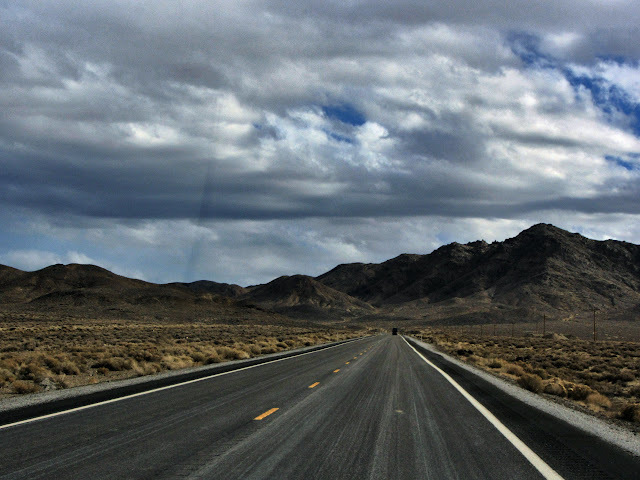 Though the writer intended the article as a slam against central Nevada, state and local officials embraced the moniker and began to promote travel on the "Loneliest Road." Nevada's tourism office published tongue-in-cheek materials inviting visitors to travel this supposed godforsaken highway—if they dare. 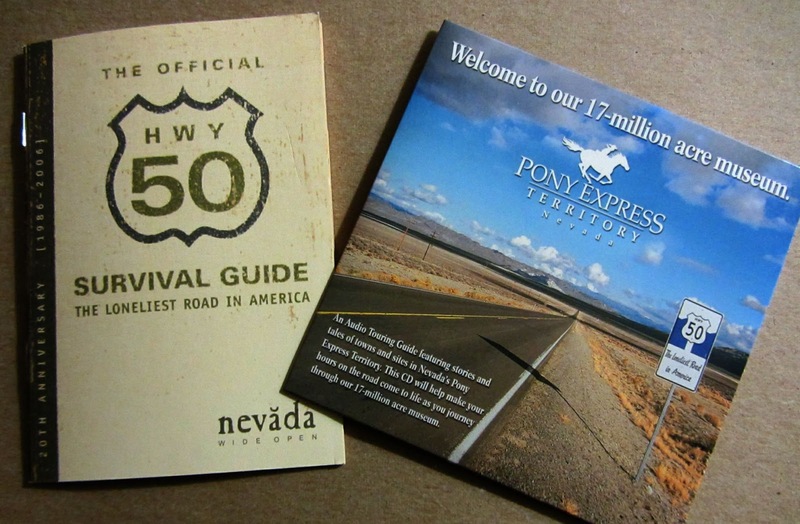 The Highway 50 Survival Challenge issues passport style documents for travelers to have stamped in towns along the highway. If the cancelled passport is then submitted to the state tourism office, the courageous adventurer will be awarded an official Loneliest Road survival certificate signed by the governor and a bumper sticker announcing that he survived this 'empty' and 'uninteresting' stretch of American road. Unfortunately for us, we didn't hear about this marvelous opportunity until we reached Ely, near the end of the road. From Lake Tahoe on the California border to Great Basin National Park where Nevada meets Utah, this 287-mile stretch of Highway 50 cuts through the heart of Nevada and the Great Basin that forms the state's interior. Looking at the long lines with very few dots on the road map, we started out this morning with the idea that we would make good time across US-50. After all, the speed limit is 70 mph, and there were precious few towns to slow down for. We were just east of Fallon, the last stop for major services for 110 miles, when we felt the first compulsion to stop. 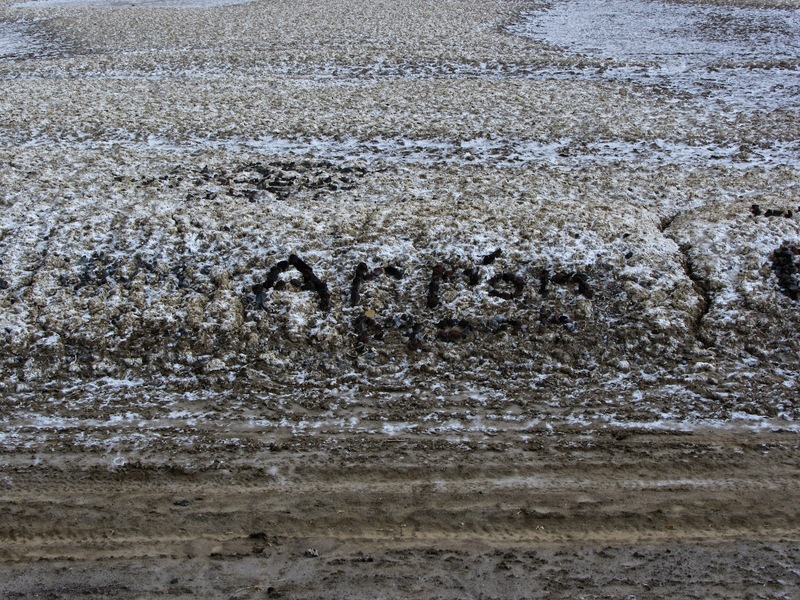 Lining both sides of the highway were names and messages spelled out in 18-inch charcoal rock letters against a pale beige dirt. Who could resist checking out some of this very unusual rock graffiti? 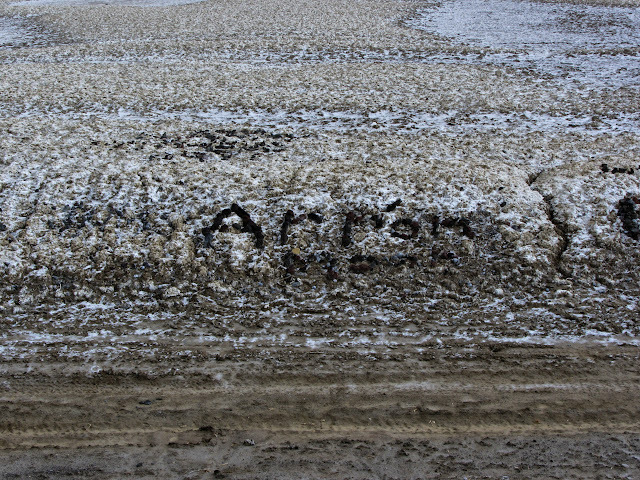 These roadside rock messages went on for a mile or more. But we were quickly on our way again—only to be stopped again a few miles farther east by the sudden appearance of a massive sand dune. "Sand dune to starboard!" And that was before we knew it was singing sand. (Wikipedia has an interesting explanation of this phenomenon.) Not only did we drive off the 50 a couple of miles to check out Sand Mountain up close, we also took the time to plant one of our 'Love This Spot' letterboxes nearby. It seems that over a period of thousands of years, winds picked up millions of grains of sand from dry lake beds in the area and blew it to this spot. 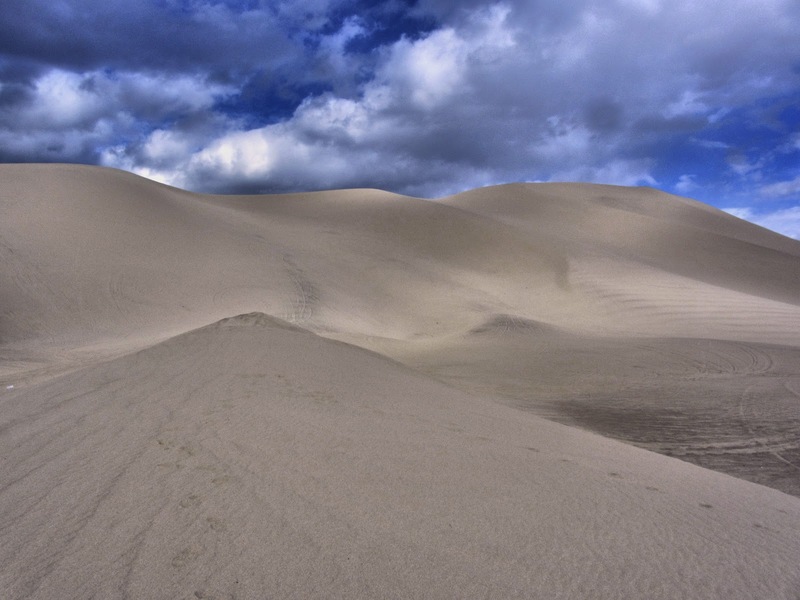 Since the winds couldn't blow the sand over the surrounding mountains, it was all deposited here, forming this ever-changing 600-ft tall, two-mile long mound of sand. 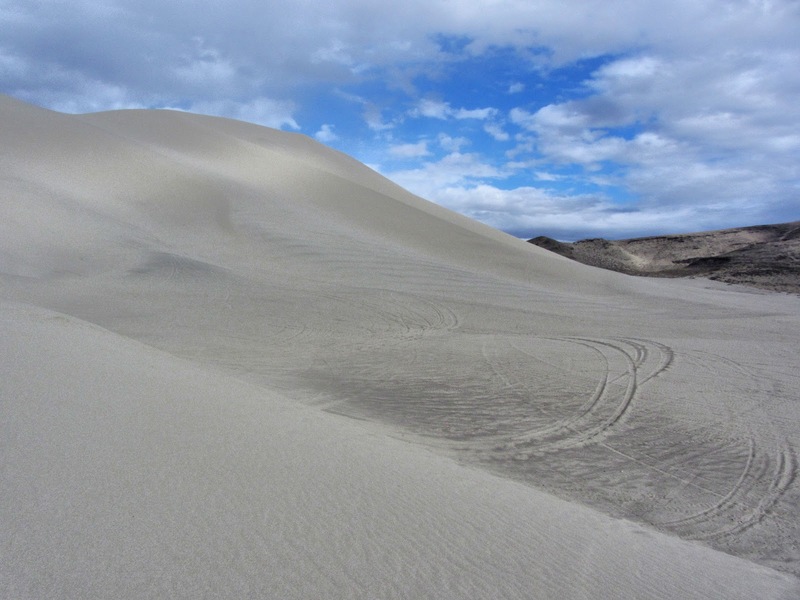 The Sand Mountain Recreation Area is a popular place for off-roaders and sandboarders. On our way again, this time we made it another twenty miles east before being stopped in our tracks by yet another unusual site near the area known as Middlegate (pop. 30— sometimes). 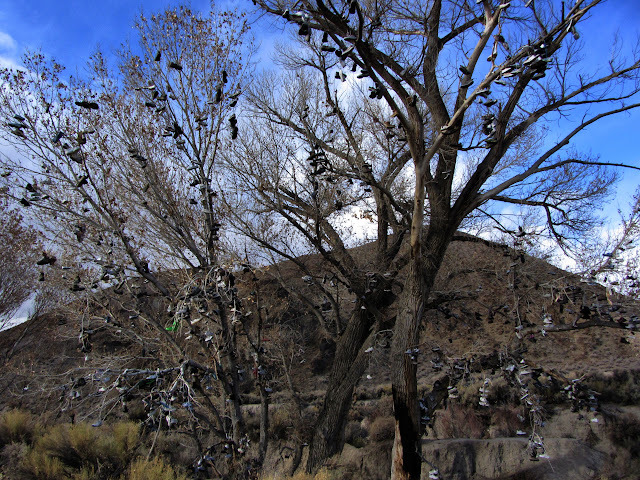 Two cottonwood trees next to a dry creekbed were bedecked with rejected footwear. According to the locals, the shoe flinging began in the midst of an argument between newlyweds camping near this spot in the 1980s. 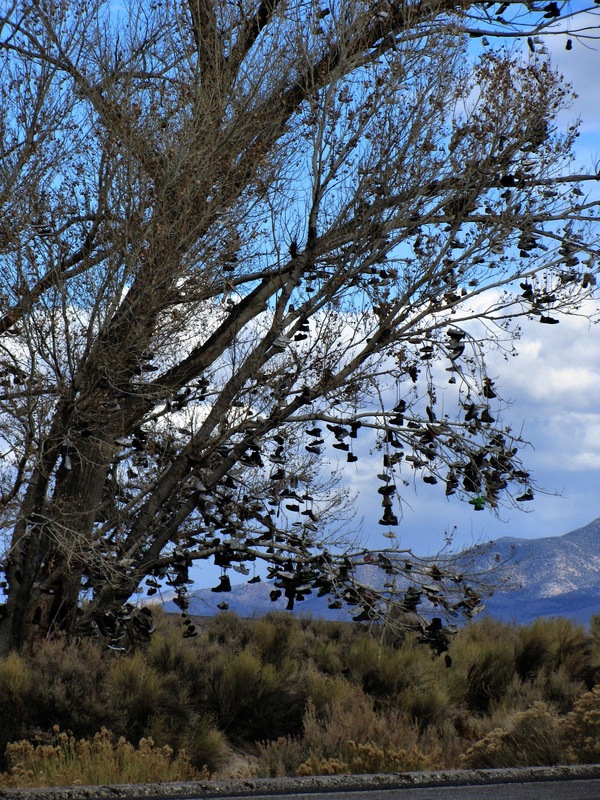 In the heat of the moment, the wife purportedly threatened to leave, and her husband threw her shoes up into the tree to prevent her from doing so. Later, after they cooled off and reconciled, the now wiser husband tendered his shoes to his bride so she could return the favor. Since then, the number and variety of shoes have grown steadily. Our habit is to travel with only one pair of shoes each, so we did not join in the shoe tossing fun, but we did plant a letterbox on a rocky bank across Highway 50 from the trees. 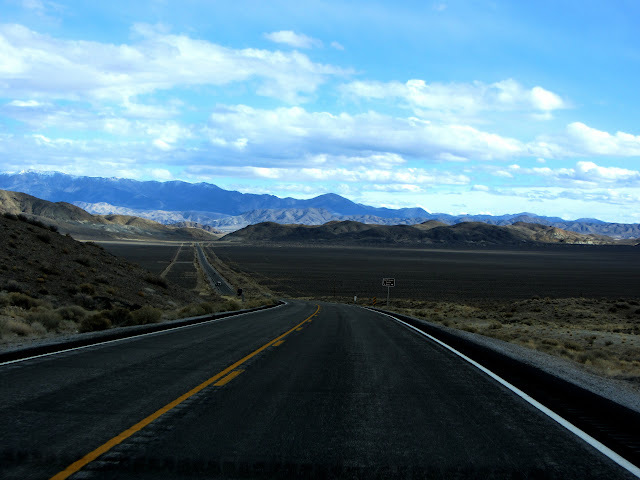 Renewing our commitment to make better time, we continued our journey on this most intriguing highway, wondering how the AAA agent could possibly have thought there was nothing of interest along this road. 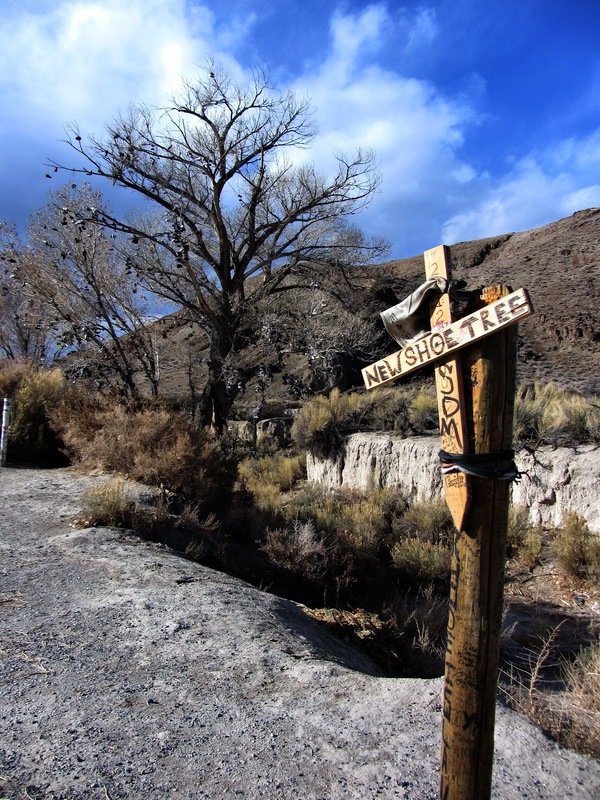 As we laid down the miles eastward, doggedly resisting petroglyphs and ghost towns, we alternately meandered across mountain ridges and hustled across sagebrushed flatlands on a pencil straight ribbon of road. With few additional diversions, we stuck to our plan in an effort to reach Ely near sunset, which would occur shortly after 4 p.m. Since this basin is home to a wide variety of roaming deer, elk, coyotes, mustangs, and other large mammals, we did not want to risk a close encounter between one of them and our car after dark when they become active and difficult to see. Arriving in Ely around 5:00, we were sorry to see our journey on the Loneliest Highway end. On our drive today, we found ourselves intrigued, fascinated, inspired, exhilarated, and even amazed—but never bored. Nor were we lonely. Though houses were almost non-existent between towns, we saw other vehicles fairly often. Based on our experience, we can only conclude that the Life writer (and his anonymous AAA co-conspirator) must enjoy amusement parks and pancake houses, which are in decidedly short supply on US-50 in Nevada—thank goodness!